If you are looking for a nice stocking filler for a fly tier, novice or experienced, these two kits could be what you are looking for. storage case that is attractive and practical. This holds 8 Stonefly tools in die cut foam. 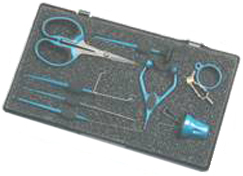 Includes Dubbing Needle, Thread Bobbin, Whip Finisher, Threader, Fur Rake, Hackle Pliers, Dubbing Spinner and Scissors. 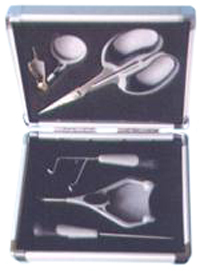 a pair of serrated bladed scissors. All packed in an attractive aluminium box. Check out our full range of Stonefly Fly Tying Products. This entry was posted in Fly Fishing, Fly Tying Tools and tagged Alumina Oxide ceramics, comfort, control, easy threading, ergonomic, finger grips, rubber coated, soft touch, stainless steel, strong grip by Mojo. Bookmark the permalink.